Stainless steel, polished aluminium and laminated glass are the basic elements of MoDuL_K® furniture. Materials that are both industrial and noble, perfect for simple configurations that blend with the most diverse interiors. 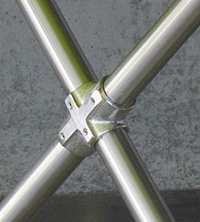 The connecting pieces in aluminium or galvanised steel blend perfectly with the stainless or galvanised steel tubes. The laminated glass, plain or in two shades, is incorporated delicately to perfect the sense of harmony and emphasise the contrast.